While university administration is denying any malpractice, students are protesting for an enquiry. An assistant professor in Department of Political Science of Hyderabad Central University has allegedly leaked a question paper of university’s Ph.D. entrance examination 2018, favoring one person affiliated to ABVP students’ group. 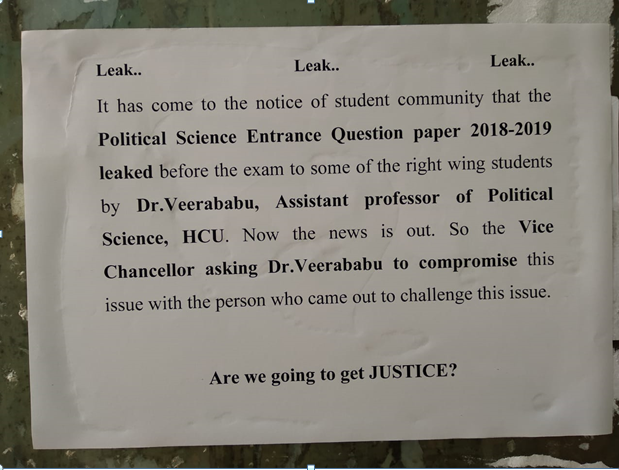 This news is being circulated on social media among the university students, and posters carrying this message have been pasted at several locations inside the university Campus. Several concerned students have staged a protest last week demanding an enquiry into the matter. Devesh Nigam, Controller of Examinations, denied any malpractice in the examination and questioned the authenticity of the posters. “The exam in question was conducted eight months ago on June 5, 2018, and the allegations made are beyond imagination,” Nigam told Newsclick over the phone. He added that there is no evidence mentioned on the posters, the posters have any signature or authenticity. A student from the Political Science Department, who wanted to be unnamed, told Newsclick that the department had constituted a committee to look into the matter. When asked about constitution of a committee for probing the leakage, Nigam said that his office is unaware of any such committee. The head of department remained unreachable. Meanwhile, the list of the selected candidates has been removed from the university website. The professor in question, Dr. Veerababu had joined the university in 2017. According to sources, Veerababu was a member of right-wing students’ group ABVP during his student life in Osmania University.